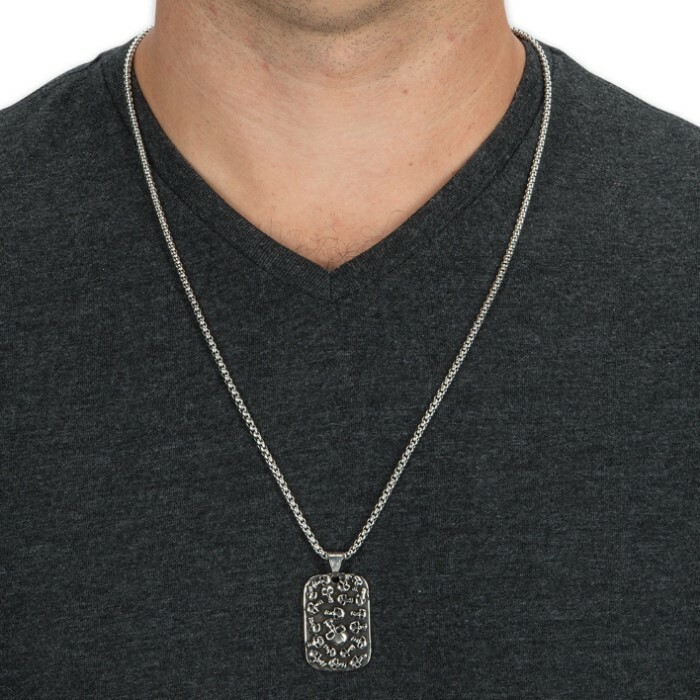 Stainless Steel Dogtag with Raised Skull Design on Ball Chain | BUDK.com - Knives & Swords At The Lowest Prices! 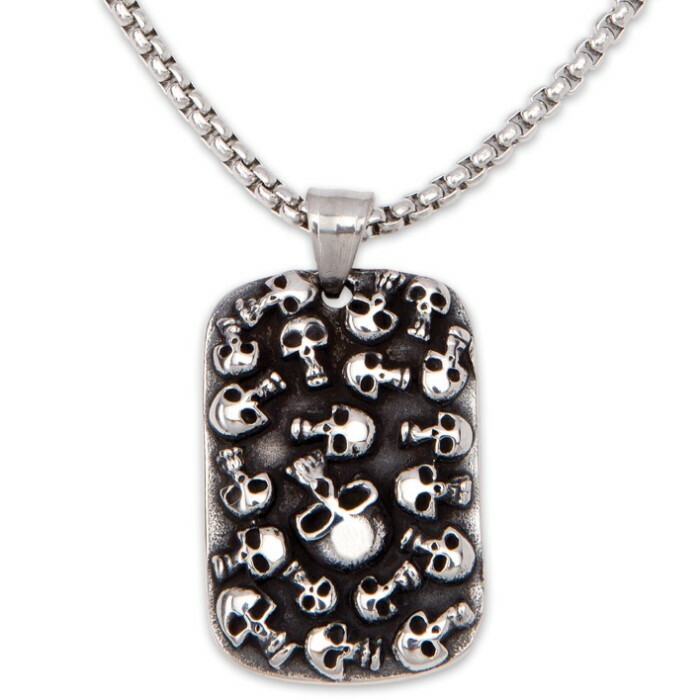 This wicked dogtag necklace features top shelf construction and a delightfully ghoulish design that's perfect for anyone whose sense of style leans toward the dark side. 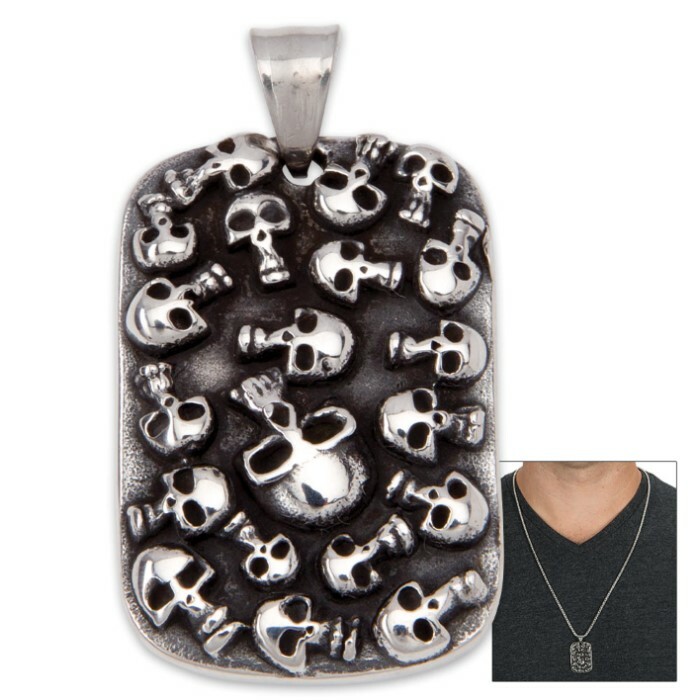 A cool stainless steel dogtag pendant, menacingly studded with human skulls in raised relief, hangs from a classic ball chain. Carefully crafted from only the finest materials, this distinctive piece is truly forged for a lifetime of vigorous wear. Silver tarnishes, gold warps and fades, and even advanced ceramics are prone to chipping. But with this rugged necklace, you needn’t fear damage while repairing a vehicle, doing yard work or performing other hands-on tasks. Furthermore, high quality stainless steel boasts a sheen and easy upkeep that simply can't be matched by more traditional materials - precious metals, composites and more. Necklaces don't get any more versatile, durable and stylish than this! It's a superb choice - for a ride on a motorcycle, a night on the town or simply as an everyday fashion accessory. It also makes a fantastic gift, and you won’t find a better price on high quality jewelry like this anywhere else. One size fits most adults. This is a great looking necklace. The chain is cool. The skull covered dogtag is super cool. Thanks BudK!